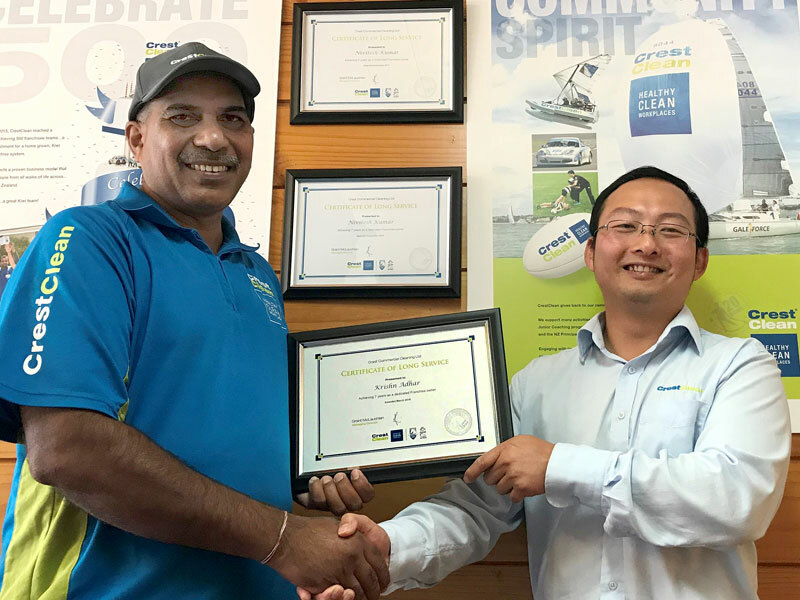 Krishn Adhar receives his long service award from Jason Cheng, a CrestClean Quality Assurance Coordinator for the Waikato. He’s been with CrestClean for seven years and he’s just as enthusiastic as the day he began. “It’s the best job I’ve had and I really enjoy it,” says Krishn Adhar, who has doubled the size of his Hamilton business over the past few years. Krishn and his wife Sangeeta are originally from Fiji and were surprised how easy it was to become business owners. “CrestClean provided the training and all the support we needed to help us run a successful business,” says Krishn. Krishn has ploughed back a lot of his earnings into his business and he’s invested in some of the latest cleaning equipment. It’s meant he can offer customers a wider range of services, such as hard floor care and carpet cleaning. “With CrestClean it’s easy and there’s no limit to growing your business. The work is rewarding there’s a great feeling of satisfaction when you do a good job and the customer is happy,” he says. Regular upskilling means Krishn is well prepared to tackle any job – large or small. “From builders’ cleans, to floor care or carpet cleaning, you name it and I’ll be there,” he says.